MESSE BASEL, SWITZERLAND, MARCH 22, 2018 -Today, Casio America, Inc. presents several new timepieces across the company’s brands, including G-SHOCK, Edifice, and G-MS. Casio continues to expand on Bluetooth connectivity this year while offering superior, timeless and durable watches. The latest models will be on display at Baselworld from March 22-24 at the Casio booth located in Hall 1.1 B67, B71. “We’re excited to return to Baselworld this year where we’ll be displaying the latest timepieces across our top brands," said David Johnson, Vice President of Casio’s Timepiece Division. “We’re continuing to innovate with technology and performance, specifically in regards to Bluetooth connectivity, and these watches are just the latest representation of Casio’s efforts." The latest collaboration with third generation master craftsman Biho Asano, this special edition men’s MR-G model was inspired by the unique texture found on the hilt guard of traditional Japanese swords. To achieve this one-of-a-kind look, Asano individually hammered each bezel, resulting in an artistic, titanium sword guard finish on every watch. Additionally, this textured hammer tone is applied to the inner band parts and the colors featured on the bezel and band boast shades of copper and deep violet found on the handle of Japanese swords. The MRGG2000HA-1A timepiece also includes premium features such as three-way time sync, made possible via Bluetooth Connectivity and the G-SHOCK app, as well as G-SHOCK’s GPS Hybrid Wave Ceptor technology, which accurately measures time and location from anywhere on earth. The MRG2000HA-1A also features a sapphire crystal, titanium case and band with a special deep-layer hardening treatment – rendering it five times harder than regular titanium, and tough solar technology for self-charging capabilities. Part of G-SHOCK’s luxury MT-G men’s collection, which is known for its metal and resin-hybrid construction, the MTGB1000-1A features a polished look, complete with a redesigned core guard box frame, which yields a 1.11mm slimmer and 1.58mm smaller case width. In addition, a new band structure composed of urethane and fine resin is affixed to one other by screws, then securely affixed to the case with metal parts. 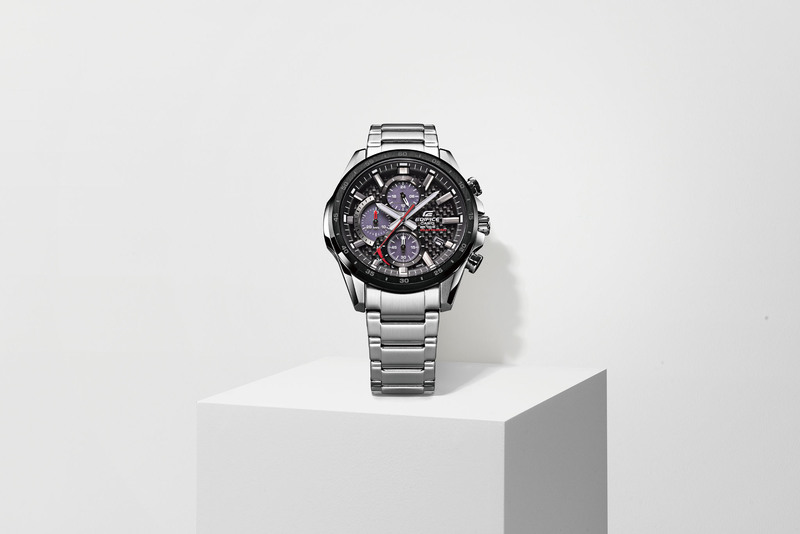 The model also comes with premium features such as two-way time sync made possible via Bluetooth Connectivity and a dedicated G-SHOCK app, as well as G-SHOCK’s Multi-Band 6 Atomic Timekeeping Technology, which provides accurate timekeeping virtually anywhere via radio signals from up to six different transmitters worldwide. The MTGB1000-1A also features a sapphire crystal to protect against scratching and tough solar technology. The ECB800DB-1A, part of Casio’s EDIFICE line of men’s timepieces, includes dynamic features in its stylish design. Featuring Casio’s Connected technology, the ECB800DB-1A is connected via the dedicated Edifice Connected app and Smartphone Link capability, which means that this timepiece will automatically pair with the wearer’s smartphone by pressing a dedicated Bluetooth® connection button. An Accurate Time System automatically connects to the internet via the wearer’s smartphone four times a day to acquire timekeeping information and keeps the watches time, time zone and DST settings accurate. In addition, Tough Solar functionality enables the timepiece’s batteries to charge via a shadow dispersing solar panel on the watch. Other features on the dynamic ECB800DB-1A include a speed indicator, target time indicator, Phone Finder, Super Illuminator, one-push reset, 300-city world time, and water resistance up to 100 meters, and more. The newest addition to Casio’s BABY-G line of timepieces is the G-MS MSGS200. Created with style in mind for the sophisticated woman, the MSGS200 showcases a fashion-forward slim 12.3mm, compact design with stainless steel bezel and resin band. Features of the MSGS200 include shock resistance, 100M water resistance, Super Illuminator LED light, solar powered battery, world time (with 31 time zones / 48 cities), daily alarm, and more. Casio’s female timepiece brand, BABY-G, was created as a counterpart to its “big brother" G-SHOCK in 1994. The brand exemplifies the meeting of fashion and function for the vibrant, active woman with watches that are stylish, bold, tough and chic. Equipped with the same great functionality that G-SHOCK is known for, BABY-G timepieces are shock and water resistant with multiple daily alarms and stopwatch functions. The brand has partnered with some of the hottest names in music, fashion and pop culture on standout watch collaborations including Ke$ha, Rebecca Minkoff, Joyrich and Married To The Mob. For additional information on Casio’s BABY-G line of timepieces, please visit www.baby-g.com.